Males coo during courtship, silent most other times. Description: Shallow sloping forehead. Long black bill. Head and neck are chestnut, back and sides whitish-gray, black tail. 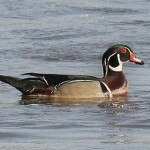 Female has brown head and breast, gray-brown back, and same sloping forehead. 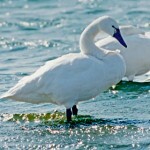 Habitat: Found on marshes, rivers, and shallow lakes with submerged vegetation during migration. 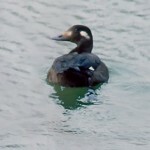 During breeding the species prefers moderate to large lakes with emergent vegetation. 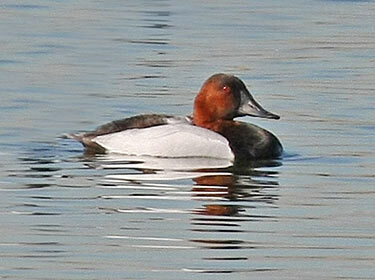 Where in Nebraska: Look for Canvasbacks on large lakes and reservoirs in early April. Also, Lake McConaughy during winter if open water exists. Nebraska Seasons: Common, locally abundant, regular spring and fall migrant across the state. Rare, locally uncommon, regular breeder in the Sandhills region of Nebraska. Uncommon casual winter visitor. Fun Facts: Canvasbacks are the largest of Nebraska’s diving ducks and great fliers reaching speeds up to 70 miles an hour.